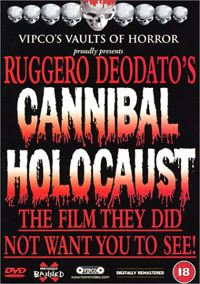 You could go through most of your life having never seen an Italian cannibal film. I ruined my shot at a perfect score a few days ago when I knowingly entered into the most fiendish flesh-eating fiasco this side of Phoenix (pronounced as with an “f” sound so the alliteration holds together). My associate (whom we shall call Matt) and I rented from our favorite nearby psycho-cinema store the dreaded cannibal triple threat: Ruggero Deodato’s Cannibal Holocaust (1980), Umberto Lenzi’s Cannibal Ferox (1981), and Antonio Margerhetti’s Cannibal Apocalypse (1980). For those with a past or future in extreme cinema, Holocaust is probably ringing some bells than the other two. It is infamous for being one of the most brutal films ever made. It has long been banned in most countries with any sort of regulations whatsoever. Matt and I, possessing no such restrictions, salivated over the recent American DVD re-release of such a notorious film. Matt had seen it many years before and all I had ever heard him talk about was the scene in which the characters pull a live leatherback turtle out of the water and proceed to dismember and disembowel it. The scene had apparently left quite an effect. To this day, Matt cannot bring himself to mutilate any living reptile. On a more serious note, this is the single reason this film is so controversial. The human gore and torture is standard fare, especially if you have ever seen and of the Romero Dead movies. What really irks people is Cannibal Holocaust’s unflinching portrayal of violence inflicted upon live animals. Animal lovers, or life lovers be advised: THIS MOVIE SHOWS A NUMBER OF ANIMALS KILLED! EXPLICITLY! There are at least five live animals killed onscreen in this movie. It is very hard to take. It is very hard to defend, but the film exists. 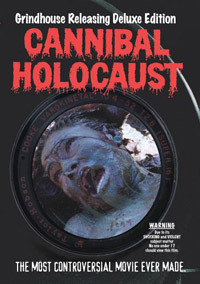 Almost more alarming than the brutality toward animals, Cannibal Holocaust is a very pointed, skillfully crafted film. I have a long history with exploitative and violent cinema. I expected nothing more than an extremely brutal incompetent waste of film, but surprisingly, only Ferox fits this bill. Holocaust is a great film. It has a very definite point. Holocaust casts us as the destructors as opposed to the exotic, albeit “savage”, tribes of the Amazon River Basin. It is presented under the pretext of a documentary. A film crew ventures into the Amazon to find evidence of cannibalism. Something, of course, goes terribly wrong, and a team is sent into the jungle to recover their footage. The recovered footage is presented in the film as a documentary, and it is handled exceptionally well. This is almost three decades before The Blair Witch Project, and must be commended on those grounds. What we learn through the footage is that the filmmakers are the ones violently out of control. They are nothing but destructive. The natives may eat human flesh, but it is modern culture that is savage. (This exact sentiment is presented very bluntly at the close of the film). On the other hand, we have Cannibal Ferox, Lenzi’s self-proclaimed “masterpiece.” Ferox is a soulless cashing-in on the controversy of Holocaust. There is no redeeming element to it whatsoever. It is aggressively mean and boring. It is not bad enough to be funny, and not short enough to be worthwhile. It is so blatantly a rip-off that Lenzi even kills off the exact same animals. Except in his film, apparently he was unable (or unwilling) to get away with as much, because he has the animals kill each other. A python eats a rat. An alligator and a turtle go at it. The animal violence is even more upsetting than in Holocaust because it has no context. Seeing animals attack each other is one thing, but when interjected with no other reason than to shock it is something else entirely. Ferox is not worth viewing except to turn that page in your own personal history of film. These are both very infamous movies in their own right, and not without reason. 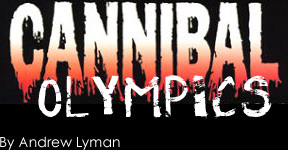 Finally, we have Cannibal Apocalypse. A very bizarre little movie riding the same cannibal bandwagon, Cannibal Apocalypse is Italian, but was filmed near Atlanta, Georgia, and stars American actor John Saxon (Enter the Dragon). Much fun was had viewing this movie, but only because of its overbearing dumbness. The crisis of the film is apparently that people are turning into cannibals (zombies), but only a little bit. If you get bitten by a zombie (cannibal) nothing too bad seems to happen. You might have a slight hankering for flesh, but it's really nothing you can’t handle. You don’t become irrational. You don’t lose your mind or really even attack your loved ones. You have the embarrassment of having been bitten by someone, and now you probably won’t like the cops or government - not enough to try and overthrow or attack them or anything, but you’ll probably just want to avoid them. That’s what I gathered anyway. This movie is hilarious. It’s fun because it’s so bizarre and unclear what the filmmakers were thinking. It's worth watching on a rainy, or snowy, November night. So what have I learned from this filmic flesh feast? All I know for certain is that cannibalism is awesome. I killed Matt after the credits rolled on Cannibal Apocalypse. His foot is still in a bag in the fridge. It’s a little tough now, but if you pop it in the microwave for 50 seconds it makes some pretty good sandwiches.